Anthony Hepworth Collection, United Kingdom. 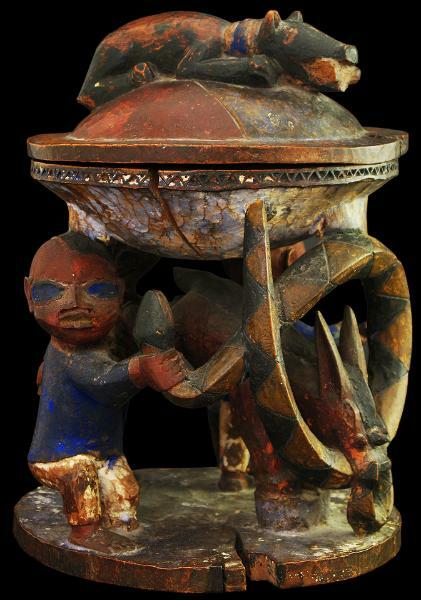 This finely carved Yoruba divination bowl is of a standard rarely encountered on the open market. 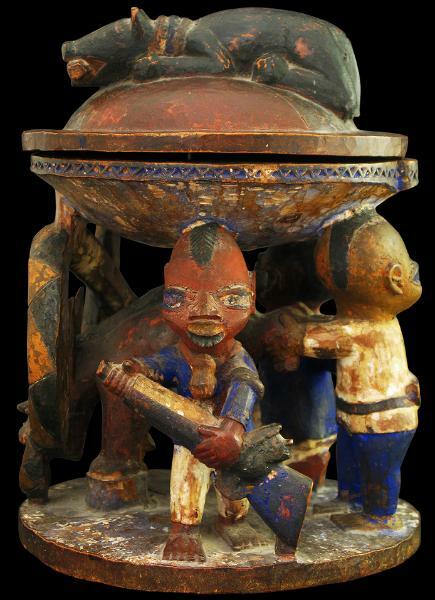 The sculptural quality is superb as is its value as a material artifact of the complex belief systems of the Yoruba. Its great age is very apparent from its excellent patina. Unusually, it also has a cover. The scene is fluid and dynamic. A curling python emerges from the base of the bowl; its body patterned with black triangles and yellow diamonds. A warthog stands below. It grasps the python’s body. A smaller python grasps the warthog by the mouth. A hunter holds a flintlock gun; a gun powder container is around his neck. He is the only stand-alone figure in the group. A second hunter holds the rear legs of the warthog. He looks away from the warthog’s lifted rear. A third hunter withdraws a knife with one hand and seizes the python’s head with the other. 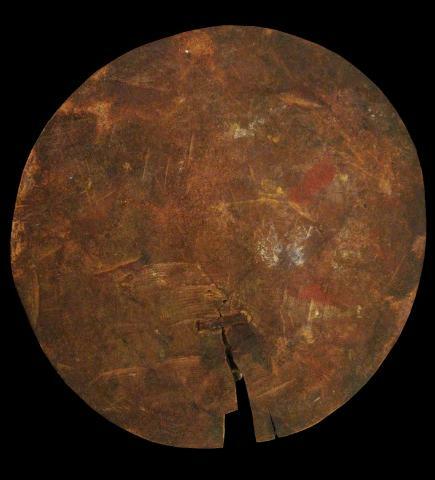 The mouth of the bowl is incised and painted with a star-shaped pattern in red and yellow. The exterior rim is decorated with triangles painted in blue and white. The base of the bowl and the circular ground have a cover of powder blue paint. 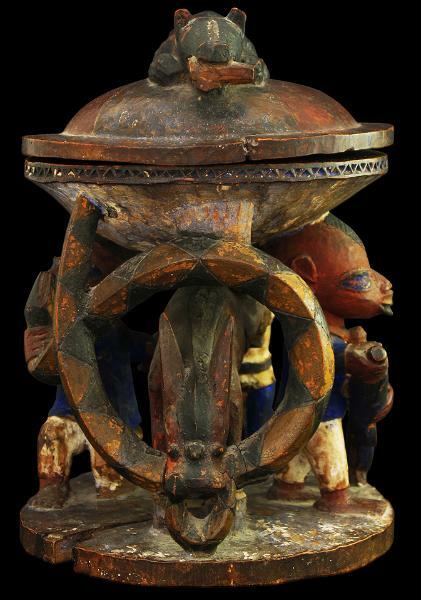 The bowl is fitted with a domed hemispherical cover or lid that is surmounted by another, crouching warthog. This warthog has three neck rings and holds a scroll in its mouth. Half its body is coloured with black ochre and the other half is yellow. A cross divides the hemispherical lid into four parts coloured yellow and black. 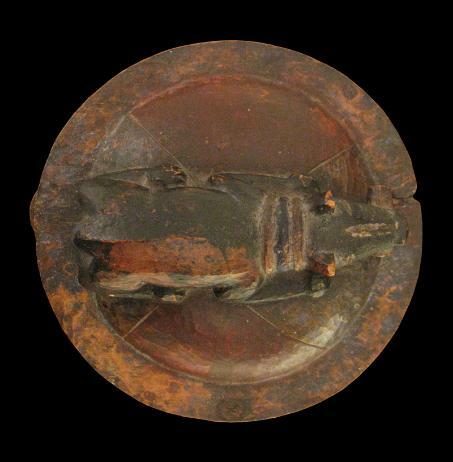 The bowl has a superb patina that is consistent with a late nineteenth century dating. There is some old, shrinkage-related cracking to the wood as is usual; there is an early, native mend to a crack in the base. 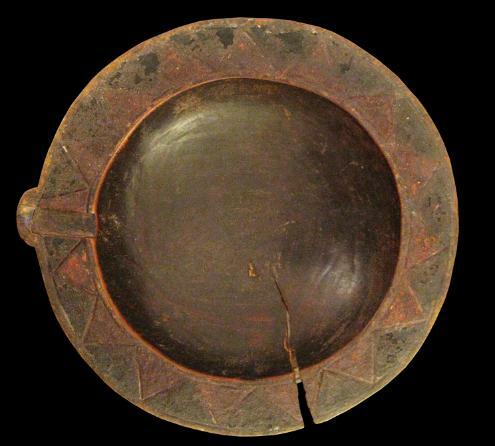 Such bowls were essential for rituals in which fate or prophecy (ifa) was divined. 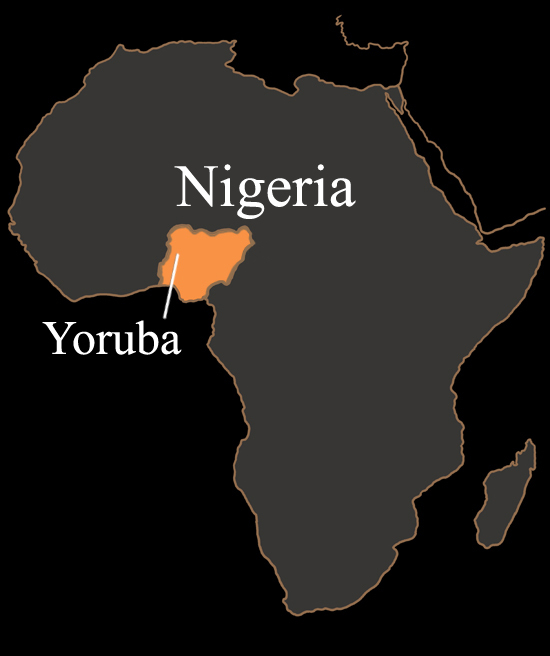 Ifa divination was used to transcribe the wisdom of Orunmila, the spirit of wisdom, divinity and prophecy in Yoruba mythology. 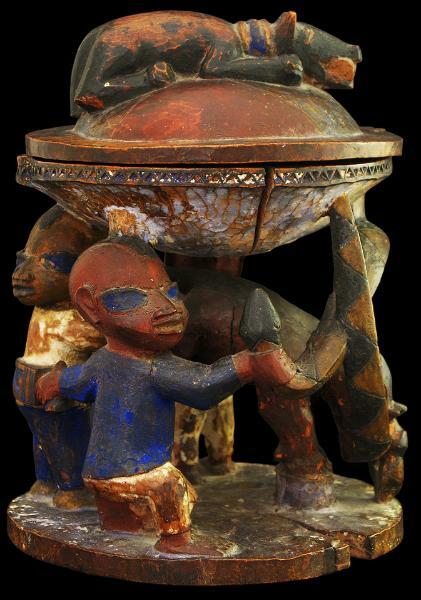 A highly-trained priest, the babalawo, taps rhythmically on a tray (the opon ifa) with a tapper (the iroke ifa) to invoke the presence ofOrunmila. A divination bowl such as this example is used to contain the sixteen sacred palm nuts (ikins), which must have at least three ‘eyes’. According to Yoruba mythology, the warthog was the most beautiful creature of the all animals at the time of creation. Its head was decorated with gems. However, the gods were disgusted by the warthog’s habits, his rooting around in the mud, and so on. They replaced the gems with warts and the gems were entrusted to the python instead. The python, which symbolises the rainbow, safeguarded the gems by burying them at the point where the rainbow meets the earth. The warthog threatened to kill the python, but still he did not return the gems. Incensed, the gods sent messenger deities (the eshu) in the form of hunters to protect the python. This bowl is a clear reference to this story, with the hunters representing theeshu who are attempting to rescue the python from the warthog. This bowl is similar to one in the William A. McCarty-Cooper Collection that was sold at Christie’s New York in 1992. Arguments by the ethnologist William Fagg that the McCarty-Cooper example is the work of Olumole Falade of Iseyin are cited in the catalogue. 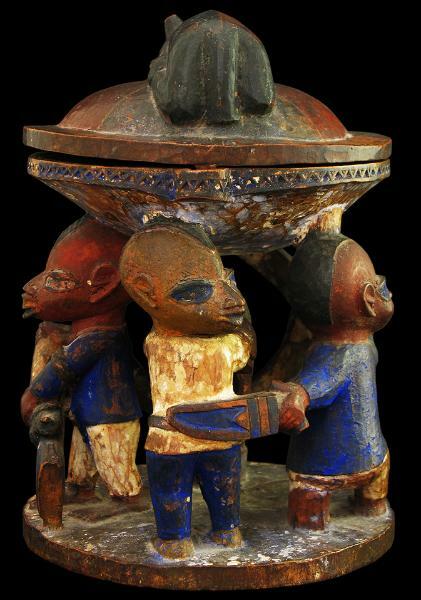 The Falade school or house of woodcarvers founded by Olumole in the mid-nineteenth century favoured hunting scenes with warthogs and other animals in close encounters with hunters. Olumole himself is believed to have died around 1915. Christie’s New York, ‘Important Tribal Art and Antiquities from the Collection of William A. McCarthy- Cooper’, lot 110, May 19, 1992. Fagg, W. & Pemberton, J. III., Yoruba: Sculpture of West Africa, Collins, 1982.